In this step by step guide, I will show you how to permanently replace Notepad on Windows 2000 with the text editor of your choice. I am using EditPad Pro in the example but the procedure works with any decent Notepad replacement. I am showing how to do it with EditPad Pro simply because it is the editor I use all the time. This web site was created entirely in EditPad Pro, except for the graphics. Note that you must be logged in as Administrator. Otherwise, you will not have sufficient access rights to Windows 2000 to make these changes. I have tried to keep these instructions as simple as possible, so that anybody can follow them. You can keep your web browser open while following these instructions. Just make sure that Notepad is not running. Note that it is important to follow these instructions exactly. If I say that you need to overwrite Notepad, then you should do so. Otherwise, I cannot guarantee that these instructions will have the proper effect. 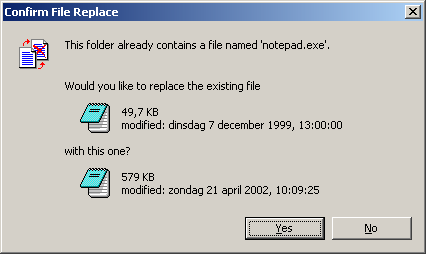 If you would ever like to restore plain old Notepad.exe, you will need to make a backup copy first. Without the backup copy, you will have no easy way of restoring the original Notepad. To make the backup copy, insert a floppy disk into your computer. The floppy disk should have at least 100 KB of free space on it. 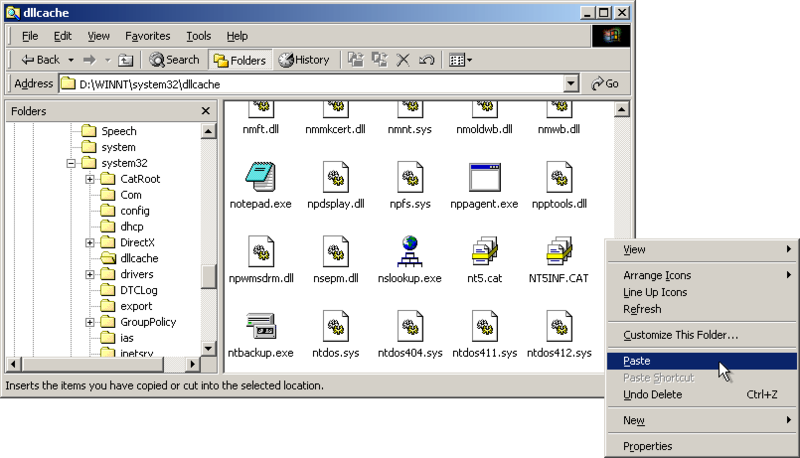 Find Notepad.exe in the C:\WINNT folder using Windows Explorer. Right-click on it, and select copy from the context menu (screen shot). 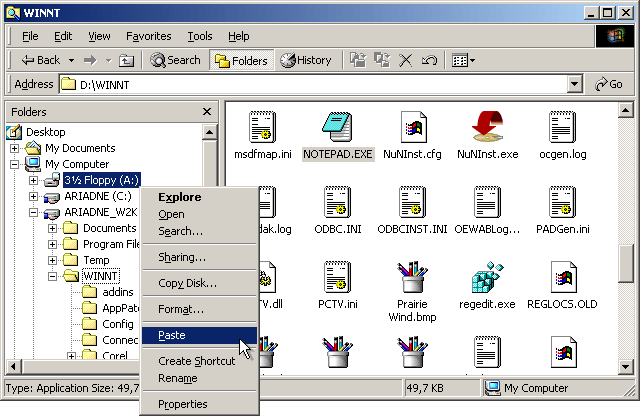 Then right-click on the floppy disk drive in Windows Explorer, and select Paste from the context menu (screen shot). 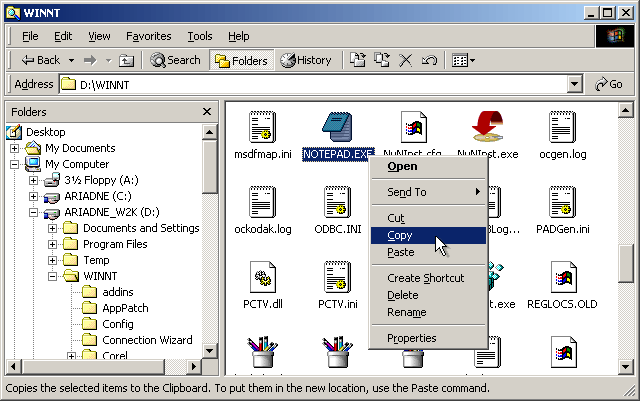 Windows will now place a copy of Notepad.exe onto the floppy disk. Important: It is important that you copy Notepad, and do not move it. Leave the original Notepad in place, so we can overwrite it later. By default, it is installed into C:\Program Files\JGsoft\EditPadPro\EditPadPro.exe. 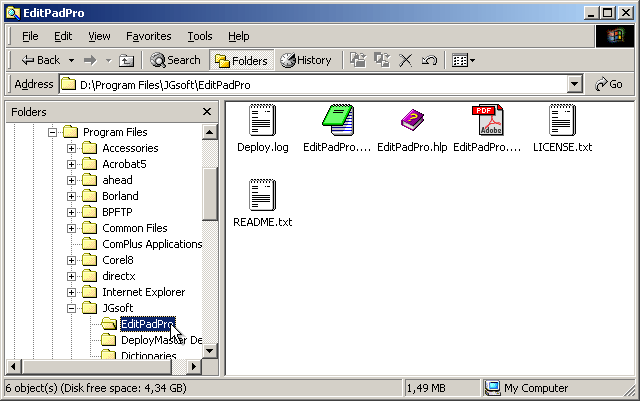 If the option to hide extensions of known file types is activated on your computer (it is by default), then the file will appear as "EditPadPro" instead of "EditPadPro.exe". 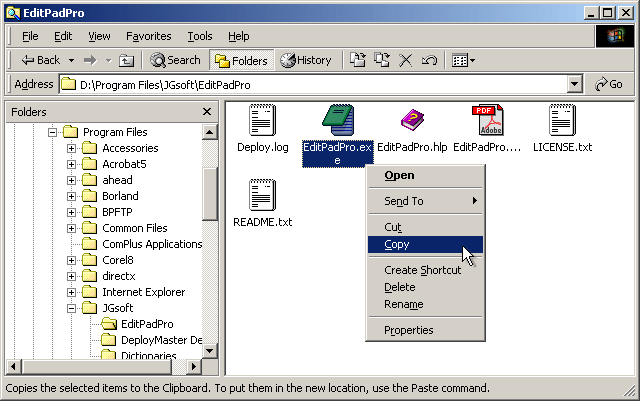 Right-click on EditPadPro.exe and pick Copy from the context menu. 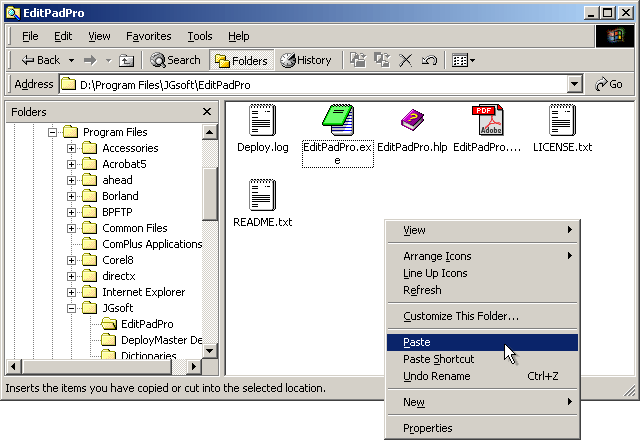 Right-click on the empty space in the right pane in Windows Explorer, and pick Paste from the context menu. You will then see a new file appear with the name "Copy of EditPadPro.exe". 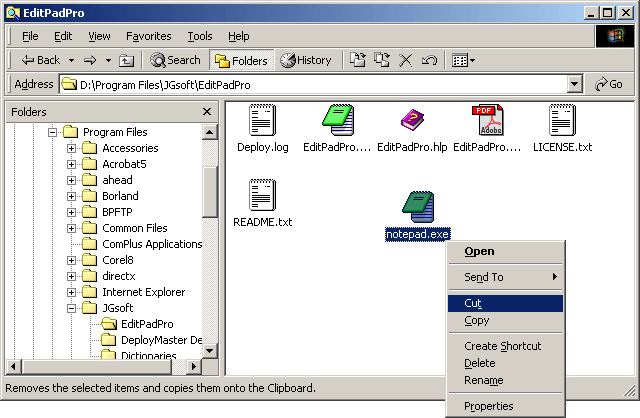 Right-click on the new file "Copy of EditPadPro.exe" and pick Rename from the context menu. 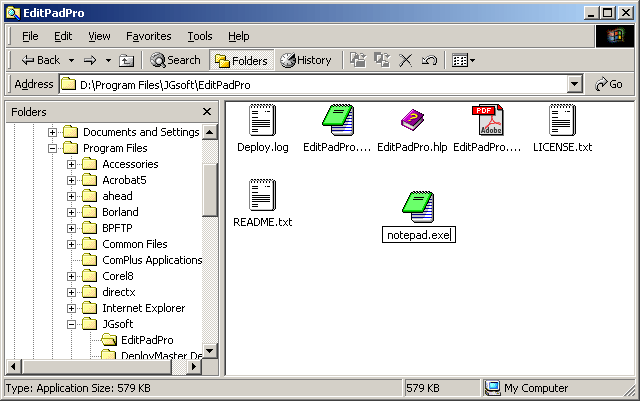 Type in Notepad.exe on the keyboard and press the Enter key to rename "Copy of EditPadPro.exe" into "Notepad.exe". 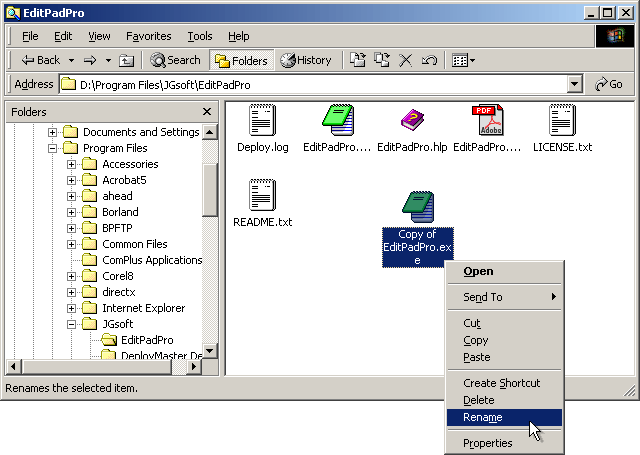 In the Folder Options screen that appears, turn ON "show hidden files and folders". Then turn OFF "hide protected operating system files". Windows will then ask you if you really want to turn off the option to hide protected files. Click on Yes. You can leave all other options as they are. Press OK to close the screen after changing options as needed. Right-click on the copy of EditPadPro.exe that we have renamed to Notepad.exe, and pick Cut from the context menu. 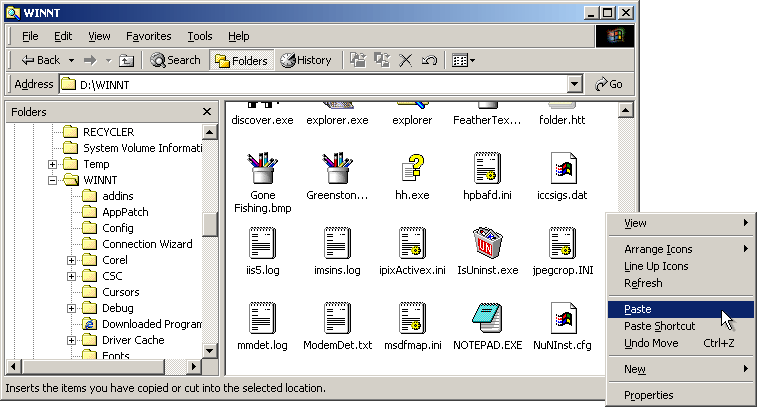 After you do that, the Notepad.exe icon will look ghostly compared to the other icons. Use the folders pane in Windows Explorer to navigate to the C:\WINNT\System32\dllcache folder. 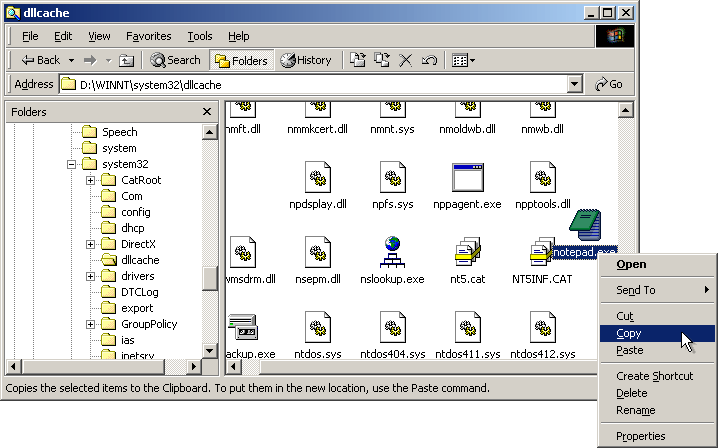 Then right-click in the empty space of the right hand pane listing all the files in the dllcache folder. In the context menu, select Paste. 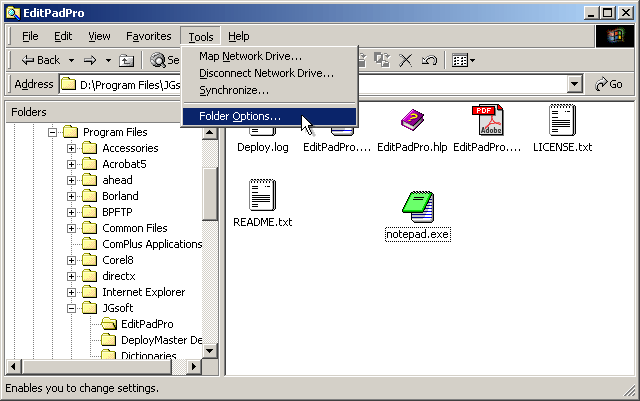 Right-click on the new Notepad.exe that you just pasted into the dllcache folder (and now shows with a green EditPad icon), and select Copy from the context menu. Navigate to the C:\WINNT folder. Right-click in the empty space of the right hand pane and select Paste from the context menu. Windows will again ask you to confirm (screen shot). Just click Yes. Wait half a minute or so. After a while, Windows will detect that you have just replaced one of it's "vital system files" (he he). It will then notice that the copy in the dllcache folder has also been tampered with! So Windows will ask you to insert your original Windows 2000 CD into your computer, so it can restore plain old Notepad. Do not insert the CD. Just click Cancel. Windows will insist, and ask if you are sure. Click Yes to say that you are sure. To prevent bad mistakes, it is a good idea to turn on the option to hide protected system files. Tampering with some of those files can really make your computer stop working, so it is best to hide them so nobody can mess with them by accident. 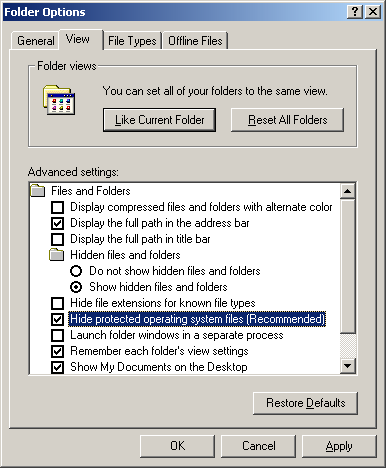 Pick Tools|Folder Options from the menu in Windows Explorer, and activate "hide protected operating system files" again.